By default Lara remains silent when she takes a pickup object. This simple tutorial will guide you through the process of making her say 'A Ha', when she takes a pickup from the ground and also from a low pedestal. You will need WADMerger and the Lara_aha .wav file. Begin by copying the Lara_aha wav into your trle/sound/samples folder. Open your sound.txt file and scroll down to find the LARA_PICKUP: entry; notice that a lot of information is missing so we'll fill in these blanks next. Copy the line below and paste it into your sounds.txt file to fill in the blanks. Save the file back onto itself and close it.. Now double click the Level SFX _Example batch file icon. This will create the new SAM & SFX files. Note: This is an MS Dos file and depending on your computer you may not see anything appear to happen. Don't worry as we'll confirm it worked a little later. 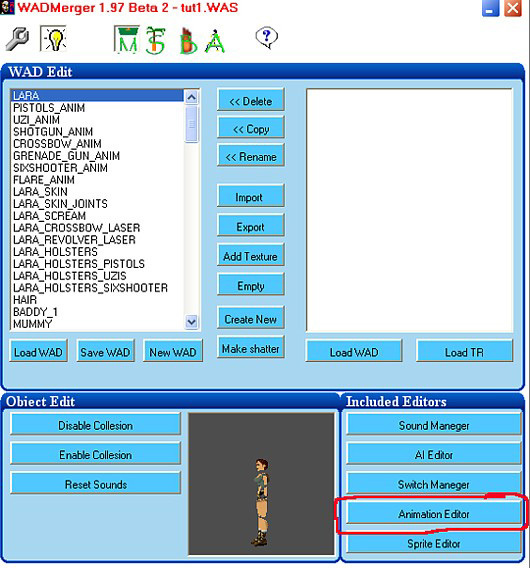 Open your wad in the left-hand window of WADMerger, select the Lara object and open the Animation editor. Click the Auto Animate object button to switch it off. From the Current Animation drop down box select animation 135; this is the 'take pickup from floor' animation. Click the Edit AnimCommands button. In the new window, which opens click the second line of text. The box should appear as in the screenshot below. The game engine is being told to play sound number 62 on frame 29 of the animation. The '62 - LARA_PICKUP' in the centre box confirms that the new SAM & SFX files were created earlier on. The 'always' seen in the box at the bottom right, means always play the sound even if Lara is underwater. Use the drop down box to change it to Land then press the Change button. The box should now look like the screenshot below. Now close the AnimCommands box. Using the Current Animation drop down box scroll down and select animation 425. This is the take pickup from a low pedestal animation. Again open the AnimCommands box, this time an empty window will appear. Select 'play sound' from the left-hand drop down box. In the next field enter 14 (this is the frame the sound will play on) from the next drop down box select '62 - LARA_PICKUP'. And from the final drop down box select 'Land' then press the add button. Here is how the window should now look. Close Animation Editor choosing 'Yes' to the save changes message& save your wad. The next time you output your game Lara will have her new sound effect. You can adjust how often Lara will use her new sound effect, by adding the chance parameter 'CH **' (where ** is a two digit number) to the LARA_PICKUP line in the sounds.txt file as in this example. The lower the number the more often the sound will play, if the parameter is omitted as in this tutorial, the sound will play every time. A value of 50 would give about a 50% chance of the sound playing. If you have renamed your wad before, things will not work. In that case, you will have to add a line corresponding to your wad in the SFX Example batch file, and the letter assigned to it. The letter could be any letter, except one which is already assigned to one of the original wads (see page 65 of the manual). However, if you build a level with the tut1 wad for example, and only change the level name, there is no problem. The tut1 wad is listed in the SFX batch file and the sounds will be included in the new sfx files. Let's look at the SFX Example batch file. After conversion it says 8 files were converted, (the original wads only). I added my wad's name to the file like this. And the problem was solved! After converting the sounds.txt again, the A HA sound can be heard in game.